What a week. Palmeiras yesterday topped the club’s worst ever campaign in a Brazilian championship with a 3-1 defeat to Santos: that’s a total of 22 defeats out of 38. Not a single victory in any of the six classicos. The list was presented on Thursday night and didn’t even remotely look like the much anticipated spring cleaning. Of the more or less regularly utilised players, out are left-winger Leandro, midfielders João Vítor and Daniel Carvalho, and forwards Betinho and Obina. In addition, a few players rarely seen will say their goodbyes: keepers Pegorari and Carlos, wingers Capixaba, Luís Felipe and Gerley, centre-backs Leandro Amaro and Wellington, midfielders Tinga and Patrik, and forwards Daniel Lovinho and Tadeu. Absolutely no surprises so far. Now, what about centre-backs Román and Thiago Heleno, who like right-winger Artur are having contracts expiring as of 31 December? No definition. And highly questioned (even in some cases despised) players like Márcio Araújo, Luan, Vinicius, Maikon Leite, Mazinho and cherry-on-the-cake Valdivia? Nothing. Alarming. At the beginning of the week we announced that an important step toward a smoother transition between presidents had been taken. Turns out the “one step forward, two steps back” have never been truer, as vice-president a.k.a. director of football Roberto Frizzo first postponed the second meeting then cancelled it altogether, refusing to meet with the gathered three candidates, football manager César Sampaio and coach Kleina. The five, while waiting for president Tirone to arrive, even contemplated conducting the scheduled meeting elsewhere but where explicitly prohibited by Frizzo to do so. After a couple of hours’ waiting, the whole thing was called off. 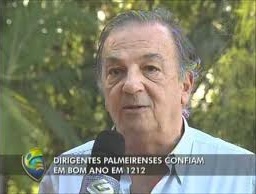 “Directorship, the cancer of Palmeiras”. The one piece of good news that reaching us this week came straight from the source and addressed the Palmeiras supporter: Barcos put up a home-made video making it clear that he would stay and play for the club unless someone made an irrecusable offer (i.e. paying the full US$ 25 million fine) for his transfer. Practice your “portunhol” watching his short declaration below. The man surely doesn’t lack a spine. Nor courage. I desperately hope he won’t look back on 2013 and think “what I lacked was brains”.